Avoid or quit smoking. Smokers have twice the risk of heart attack than nonsmokers. Second-hand smoke also increases the risk of heart disease. Exercise for 30 to 40 minutes three to five times per week. Being active or exercising regularly helps improve how well the heart pumps blood through your body. Activity and exercise also help reduce many other risk factors. It helps lower high blood pressure and cholesterol, reduces stress, helps keep weight off and improves blood glucose levels. Eat well. Follow a diet low in saturated fat, low in trans-fat (partially hydrogenated fats such as margarine or shortening) and high in fiber, whole grains, legumes (such as beans and peas), fruits, vegetables, fish, folate-rich foods and soy. Treat and control medical conditions. Diabetes, high cholesterol and high blood pressure are known risk factors for heart disease. Take one adult aspirin every day. (If approved by your doctor) – particularly in women over age 60 to 65, aspirin has been shown to decrease stroke risk by 30 percent. For many years, preliminary research showed that estrogen, through hormone therapy (HT), could possibly reduce the risk of heart disease in women. More recent studies of women with existing heart disease have not shown any benefits after taking HT. 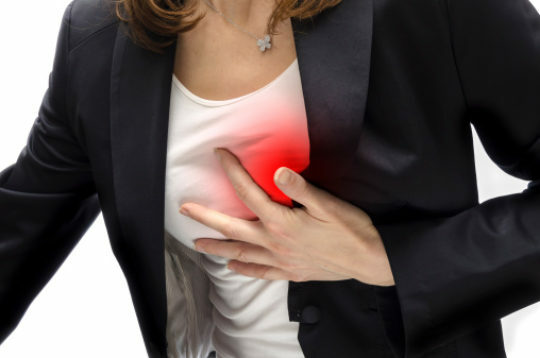 In addition, the Women's Health Initiative (WHI), a five year government study of postmenopausal women taking estrogen-progestin therapy showed no decrease in the risk of heart disease in these women. As a result, the National Institutes of Health, along with the National Heart, Lung, and Blood Institute, no longer recommend that HT be used solely to prevent heart disease. If you are taking HT to reduce your risk of heart disease, talk to doctor. He or she may recommend other methods of prevention, such as lifestyle changes, and cholesterol- and blood pressure-lowering drugs.